Join our diverse group of highly trained, creative, and tech-savvy makers, engineers, designers and inventors. Kathy H. entered an art contest where each contestant was provided half of a football helmet to be recycled into something artistic. 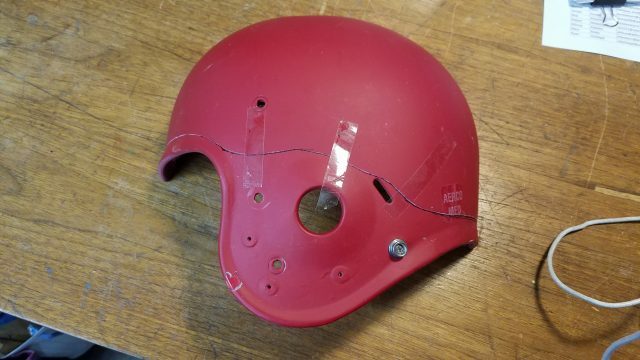 It could be modified in anyway as long as the helmet was used in some manner. 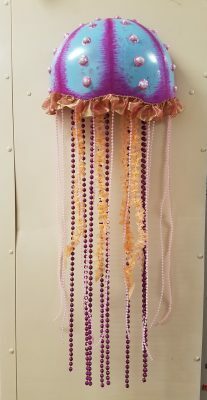 Having an idea to turn it into a jellyfish wall hanging Kathy asked another member to saw along the line she drew since she’s not skilled on all of the makerspace equipment. In order to be able to hang it on a wall a back piece was made and attached with custom made L brackets. After attaching the back the inside was spray painted gold and the outside was spray painted blue. The magenta shading was done by hand with a brush. Beads and ruffled ribbon were suspended from the inside with nylon string. The smaller beads were attached with hot glue. The ruffle along the outer edge was added with hot glue as well. Pearl beads and dimensional paint were also added to the outside. A tap light was attached inside with velcro. The lens of the light was colored with a hot pink permanent marker before attaching it. Big thanks to Tom Klein for a great modification of SoM’s filament spool holder! The original design used to have a printed ABS top roller and I just pushed the roller against the flanges and finger-tightened the nut. 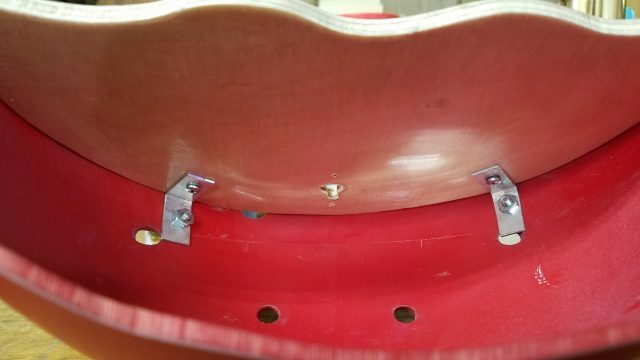 The problem was people kept taking it apart, so I added rubber bands to pull the roller down, and a nylock nut to prevent tool-free disassembly. Then the rubber bands kept disappearing, and Tom came up with the idea of making a heavy top roller so the rubber bands wouldn’t be needed. 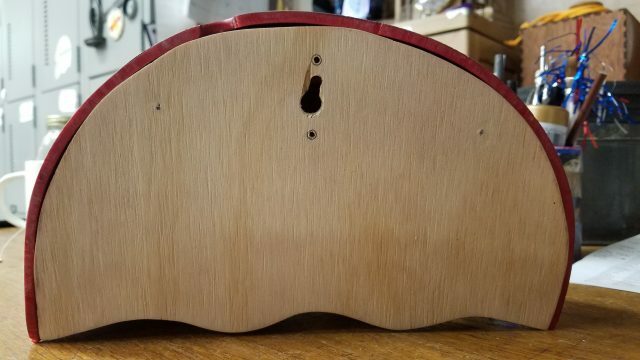 He cut a new, steel top roller on the lathe and it works great! The bolt is just loose enough to let the roller slide up and down in the slot in the frame. 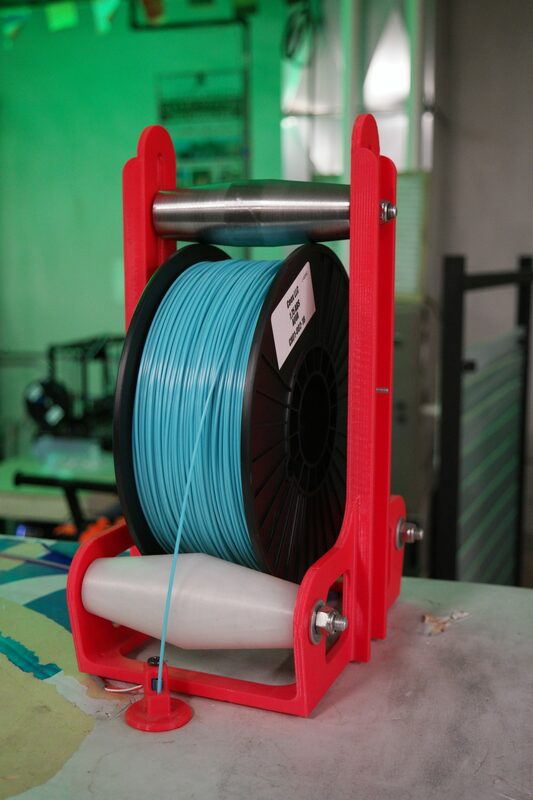 The roller is heavy enough that it just falls into position on the spool flanges. We had a visit from ShopWare during our open night on Tuesday, January 29th, 2019. 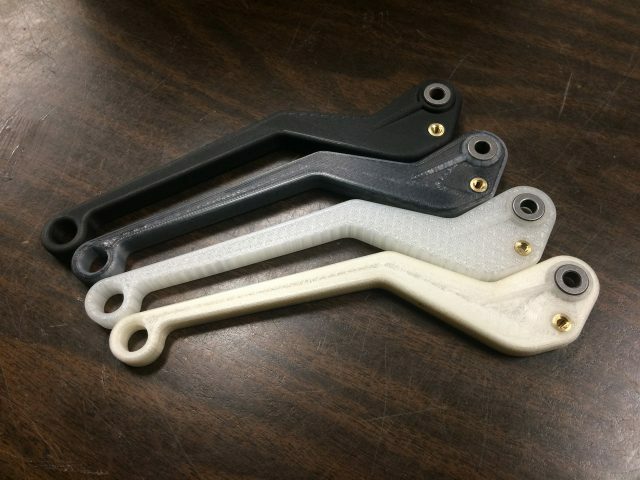 They thought we might be interested in seeing a Markforged 3D printer capable of printing with nylon, Kevlar, and carbon fiber. And they were right, we were interested! 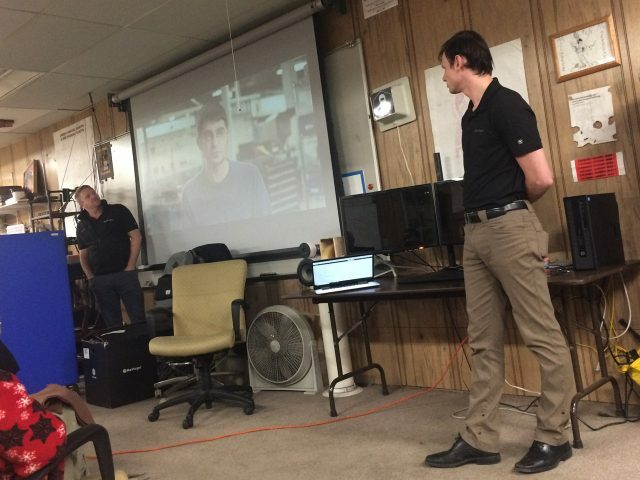 They showed a few videos that featured the capabilities of very strong 3D printed parts, and then answered questions, and had a number of samples to pass around and show off. They also brought a Mark Two for us to take a look at. 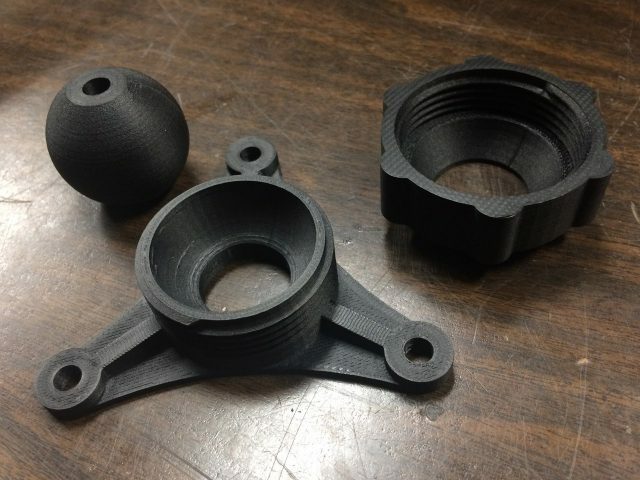 Printed threads are no problem, and again, appeared to be very strong, and the ball joint moved pretty good. 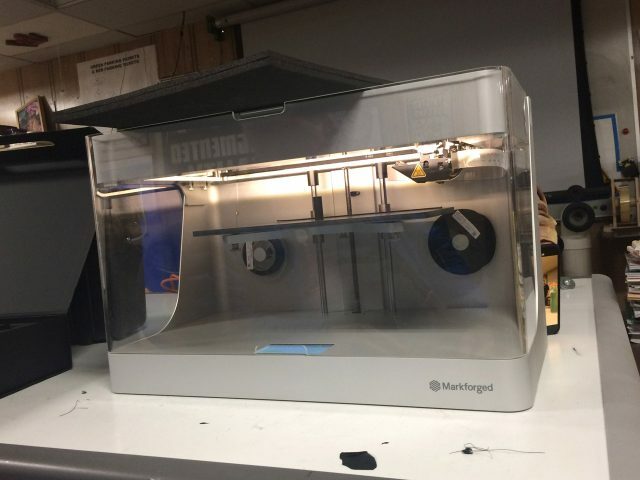 The metal part was not printed on the Mark Two, but another Markforged printer. 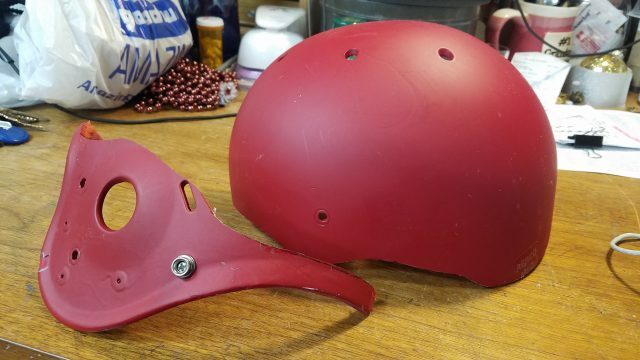 The part gets processed after it’s printed, so it shrinks a bit, but the software deals with sizing up your model before printing so it comes out the correct size when done. 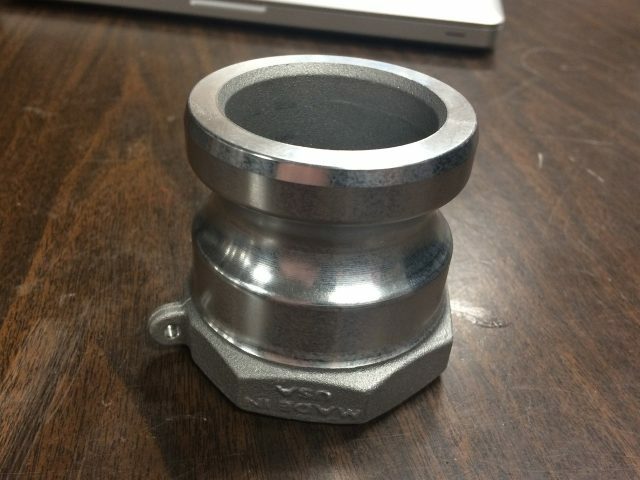 We’re pretty sure this part was “finished” a bit after printing as well, perhaps on a lathe, which would explain why the rounded part is polished while the flat hexagonal part is not. While the extreme cold weather kept some members away, we had a pretty good turnout to welcome ShopWare, and for those who were there, got to see some cool technology we home to someday have a the space. Over the years they’ve also hired a few of our members, and they came looking for more, specifically for their concepting team. 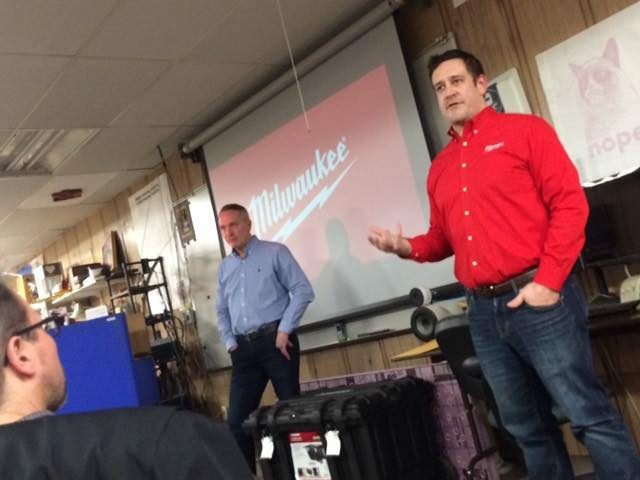 We’ve also got a few members who happen to be Milwaukee Tool employees before they joined the space, so it’s nice to have a positive relationship with them. As a designer I really enjoyed their presentation, and I hope we’ll find ways to collaborate in the future. 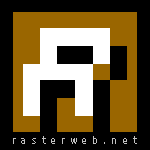 (At least a few members volunteered to stress-test any new tools they come up with! Deutsche Haus, DRO, Screen Printing and Wood Stuff! 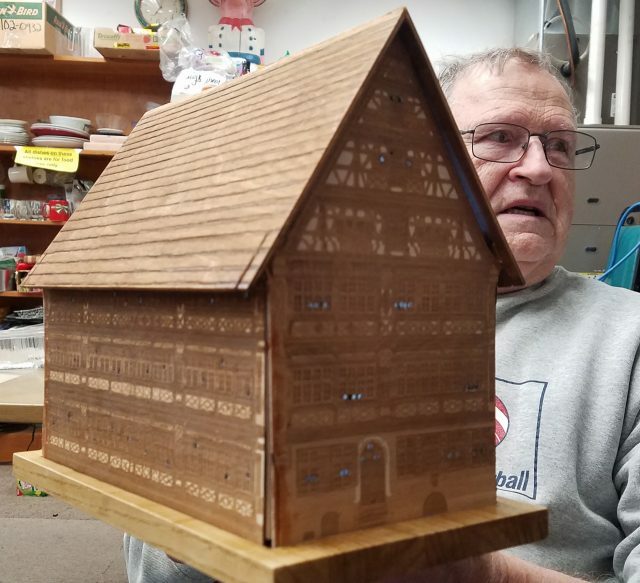 Neil made a Deutsche Haus! Neil’s wife, Fran had a great great grandfather who lived on the second floor of Hotel Deutsches Haus in Dinkelsbühl, Germany. As a gift for his wife Neil made a replica of the hotel as if it stood alone rather than sharing walls with the adjacent buildings. He created it using one of the laser cutters. He also lit the tiny windows from within to show the light inside. The Deutsches Haus was built in the 15th Century and remains in use as a hotel to this day. 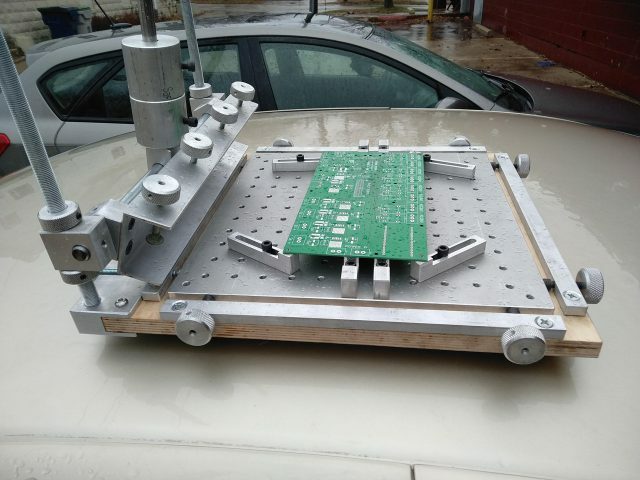 Rick made a custom rig for screen printing PCBs. 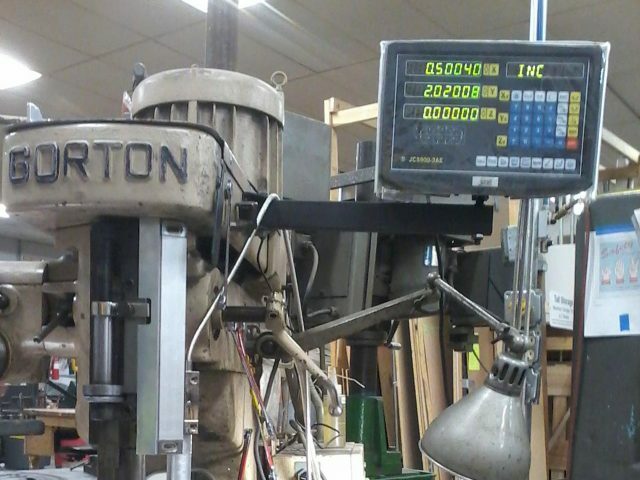 He utilized the metal shop and the wood shop quite a bit. William Re-purposed some red wine barrel staves into various gifts last month, including candle holders, platters and plant hangers.